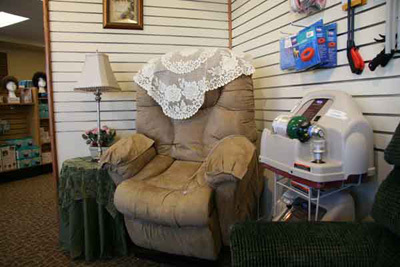 With the latest in durable medical equipment and supplies, Home Health Products offers a full line of wheelchairs, motorized wheelchairs, hospital beds and walkers as well as home oxygen therapy units such as Respironics and Homefill. We also have such items as compression hose and ostomy products, as well as manufacturer trained fitters for orthopedic braces. Motorized wheelchairs, Lift Chairs and Scooters from Pride Mobility. 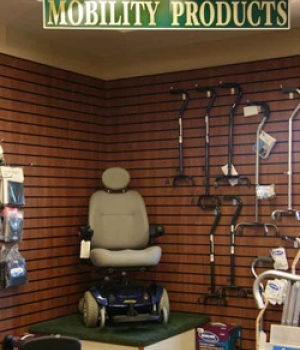 These are just a few samples of the mobility products available from Home Health Products. 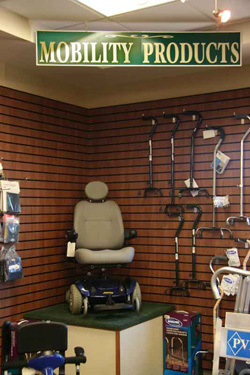 We also carry chairs from brand names Golden Lift and Invacare. Lift chairs provide a bit of extra help to individuals who have trouble getting up and out of a chair. These chairs are available in many styles, fabrics and colors with extra-wide seat cushions and extended weight capacities. Patented features provide quiet, smooth operation and stylish design to fit any decor. Medicare does not cover lift chairs. However, Medicare does cover the seat lift mechanism within the chair for qualified patients. Our reimbursement specialists will be happy to review qualification criteria with you. Mobility Transfer Handles are the safest and most effective bedside aids for rolling, sitting, standing and getting in and out of bed. They are easily installed on any size bed. Overbed Tables are an excellent aid for bed patients and caregivers alike. This product assists in bath time, during meals, while grooming or taking care of personal business; and can be easily rolled out of the way when not in use. Reacher Grabbers assist patients when bending, stooping and reaching is a challenge. Removing items from shelves or the floor become much easier with a reacher grabber. Grooming Aids include a wide variety of products designed to assist persons with dressing themselves. Products include long handled shoehorns, buttonhooks, zipper pulls, dressing sticks and sock aids. Dining Aids offer patients independence. They are designed to assist persons in feeding themselves. Flatware options include weighted, angulated and comfort grip handles. Specialty plates are designed to be nonskid and many are made with a lip edge so that food can be scooped up the side and onto the utensil. Drinking glasses and cups are prepared for every patient need. Some glasses and cups are made with two handles, cutouts for the nose, special shape for whiplash or neck injury victims and weights to keep them from tipping. Respiratory aids treat conditions such as sleep apnea, asthma, COPD and various lung diseases and disorders. We carry a wide selection of products for respiratory care including CPAPs, BiPAPs, face masks, nebulizers and oxygen systems. Medicare covers most respiratory assistive devices and we will be happy to review your situation with you. The Invacare Home-Fill system fosters independence for the patient by allowing you to fill your own cylinder from a concentrator with an unlimited supply of portable oxygen. The portable cylinder lasts approximately 4 hours between refills and has a continuous flow option. The connection and controls are designed for easy operation. Patients can fill cylinders while receiving oxygen from the concentrator. It gives ambulatory patients greater freedom and independence, virtually eliminates the high service costs of frequent deliveries of cylinders and-or liquid oxygen and is small and lightweight. The Respironics Ultrafill is an advanced home oxygen system that combines a stationary oxygen concentrator, filling station, and high-capacity 3,000 PSI cylinders to meet the needs of a wide range of oxygen patients, including those who are highly active or require continuous flow oxygen. UltraFill also has the needs of homecare providers in mind with features intended to save money by using existing inventory and lowering operating costs. We offer the Invacare Solo, Invacare XPO2, and SimplyGo by Respironics. The portable concentrator can be plugged into the cigarette lighter in the car. It runs off batteries and is airline approved.It is the only oxygen device that is approved for air travel. The DeVilbiss Pulmo-Aide Compact Compressor is a small footprint unit which allows for therapy at home or can be easily transported for AC use while on the go. It features ease-of-use, a 5-year warranty and the same reliable operation you can count on from DeVilbiss. Supplies such as mouthpieces and hosing can also be purchased at Home Health Products. This is just some of the many oxygen products available at Home Health Products. Home Health Products offers noninvasive ventilation therapy for the patient diagnosed with Respiratory Failure and Chronic Obstructive Pulmonary Disease. Our Registered Respiratory Therapist will provide specialized therapy in the home using the latest respiratory technology: the Respironics Trilogy Ventilation System. When initiated early, non-invasive ventilation therapy can reduce hospital admission rates, length of stay, and the cost of healthcare while maintaining or improving quality of life for the patient. For safety and support in and around your bathtubs and showers, grab bars are an inexpensive solution. The textured-grip bars mount easily to most surfaces and come in varying lengths. Specially designed grab bars that provide safety and stability when getting in and out of the bathtub are also available. Home Health Products offers bath benches and shower chairs with a variety of features. Some are designed specifically to aid in transfer with sliding swivel seats. Others are lightweight, compact and ideal for travel. Side handles, position locks, back rests and drainage holes add to the convenience and stability of these handy products. There are commodes available designed specifically for persons who have trouble getting on and off the toilet. These durable commodes provide stability and convenience and come with features that assure user safety and instill confidence. Soft foam handles, splash guards, adjustable legs and non-skid, non-marring rubber tips are just some of these features. Now featured at our new store are visual displays so you can see how an item might look and function in your home. We always do a home assessment to analyze the patient’s condition and home environment so that we can recommend the best equipment for your needs. This is done at no extra charge. It is simply part of our expert service. 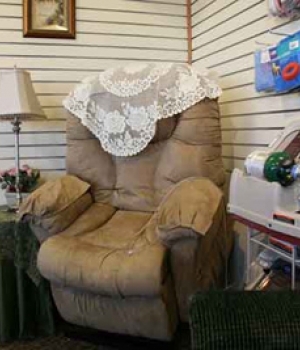 Home Health Products has a wide selection of walkers, wheelchairs, shower chairs and other home care necessities. We have a Bath Safety section that features items such as benches, shower chairs, grab bars and handheld showers. Our goal is to make the patients home a safe place to live in.